Each art pieces is accompanied with a story and paintings like the Reunion of the Officers of the Guild of Archers of St. Adriaen provides a rendition of Holland’s independence against Spain. 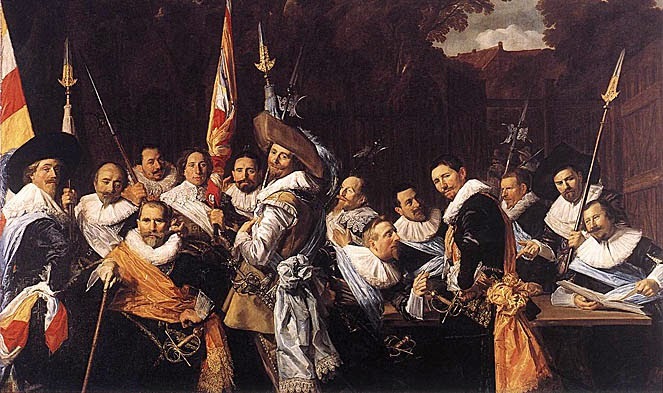 Painted by Frans Hals, it depicts those who survived the battles and have joined again in celebration. Frans Hals (1581-1666) was an emigrant from Spanish Netherlands that settled the rest of his life in Haarlem (1). Around the age of 27 he became a member of the city’s Guild of Saint Luke. They followed their Patron Saint Luke and shared resources in their painting expeditions. Hals was a wild one in his lifetime and spent a large portion of his life painting (2). He worked restoring artwork, painting notables in the area, and an art advisor to the city. He is known to have enjoyed his life just a little too much. His creative breakthrough came from paintings like the Archers of St. Adriaen. He spent a great portion of his time working and practicing until his skills were sufficient to pull off group masterpieces like the one depicted here. The painting is a celebration of the defense of Haarlem (3). The officers were on the battlefield and spent nights fighting for their homeland. They are proud creatures who are lively, bold, and decadent. They were the men of their time with all the spirit of the age. You can see that excitement with the pictures that shows men and their weapons in various stages of camaraderie. They are dressed in some of the finest clothing showing their wealthy backgrounds. They were men that have spent time together and created bonds that only battle can bring. These bonds are solidified through blood, sweat and tears.